"Oporto" redirects here. For other uses of Porto and Oporto, see Porto (disambiguation). Porto (Portuguese pronunciation: [ˈpoɾtu]) is the second-largest city in Portugal after Lisbon and one of the major urban areas of the Iberian Peninsula. 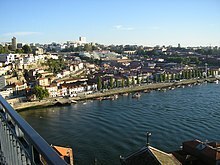 The city proper has a population of 287,591 and the metropolitan area of Porto, which extends beyond the administrative limits of the city, has a population of 2.3 million (2011) in an area of 2,395 km2 (925 sq mi), making it the second-largest urban area in Portugal. It is recognized as a gamma-level global city by the Globalization and World Cities (GaWC) Study Group, the only Portuguese city besides Lisbon to be recognised as a global city. Located along the Douro River estuary in northern Portugal, Porto is one of the oldest European centres, and its historical core was proclaimed a World Heritage Site by UNESCO in 1996. The western part of its urban area extends to the coastline of the Atlantic Ocean. Its settlement dates back many centuries, when it was an outpost of the Roman Empire. Its combined Celtic-Latin name, Portus Cale, has been referred to as the origin of the name "Portugal", based on transliteration and oral evolution from Latin. In Portuguese, the name of the city includes a definite article: o Porto. Consequently, its English name, Oporto, evolved from a misinterpretation of the Portuguese pronunciation. Port wine, one of Portugal's most famous exports, is named after Porto, since the metropolitan area, and in particular the cellars of Vila Nova de Gaia, were responsible for the packaging, transport, and export of fortified wine. In 2014 and 2017, Porto was elected The Best European Destination by the Best European Destinations Agency. Porto is on the Portuguese Way path of the Camino de Santiago. The history of Porto dates back to around 300 BC with Proto-Celtic and Celtic people being the first known inhabitants. Ruins of that period have been discovered in several areas. During the Roman occupation of the Iberian Peninsula, the city developed as an important commercial port, primarily in the trade between Olissipona (the modern Lisbon) and Bracara Augusta (the modern Braga). Porto was also important during the Suebian and Visigothic times, and a centre for the expansion of Christianity during that period. Porto fell under the control of the Moors during the invasion of the Iberian Peninsula in 711. In 868, Vímara Peres, an Asturian count from Gallaecia, and a vassal of the King of Asturias, Léon and Galicia, Alfonso III, was sent to reconquer and secure the lands back into Christian hands. This included the area from the Minho to the Douro River: the settlement of Portus Cale and the area that is known as Vila Nova de Gaia. Portus Cale, later referred to as Portucale, was the origin for the modern name of Portugal. In 868, Count Vímara Peres established the County of Portugal, or (Portuguese: Condado de Portucale), usually known as Condado Portucalense after reconquering the region north of Douro. In 1387, Porto was the site of the marriage of John I of Portugal and Philippa of Lancaster, daughter of John of Gaunt; this symbolized a long-standing military alliance between Portugal and England. The Portuguese-English alliance (see the Treaty of Windsor) is the world's oldest recorded military alliance. In the 14th and the 15th centuries, Porto's shipyards contributed to the development of Portuguese shipbuilding. Also from the port of Porto, in 1415, Prince Henry the Navigator (son of John I of Portugal) embarked on the conquest of the Moorish port of Ceuta, in northern Morocco. This expedition by the king and his fleet, which counted among others, Prince Henry, was followed by navigation and exploration along the western coast of Africa, initiating the Portuguese Age of Discovery. The nickname given to the people of Porto began in those days; Portuenses are to this day, colloquially, referred to as tripeiros (English: tripe peoples), referring to this period of history, when higher-quality cuts of meat were shipped from Porto with their sailors, while off-cuts and byproducts, such as tripe, were left behind for the citizens of Porto; tripe remains a culturally important dish in modern-day Porto. Between 1732 and 1763, Italian architect Nicolau Nasoni designed a baroque church with a tower that became its architectural and visual icon: the Torre dos Clérigos (English: Clerics' Tower). During the 18th and 19th centuries, the city became an important industrial centre and had its size and population increase. In 1996, UNESCO recognised its historic centre as a World Heritage Site. Among the architectural highlights of the city, Porto Cathedral is the oldest surviving structure, together with the small romanesque Church of Cedofeita, the gothic Igreja de São Francisco (Church of Saint Francis), the remnants of the city walls and a few 15th-century houses. The baroque style is well represented in the city in the elaborate gilt work interior decoration of the churches of St. Francis and St. Claire (Santa Clara), the churches of Mercy (Misericórdia) and of the Clerics (Igreja dos Clérigos), the Episcopal Palace of Porto, and others. The neoclassicism and romanticism of the 19th and 20th centuries also added interesting monuments to the landscape of the city, like the magnificent Stock Exchange Palace (Palácio da Bolsa), the Hospital of Saint Anthony, the Municipality, the buildings in the Liberdade Square and the Avenida dos Aliados, the tile-adorned São Bento Train Station and the gardens of the Crystal Palace (Palácio de Cristal). A guided visit to the Palácio da Bolsa, and in particular the Arab Room, is a major tourist attraction. Porto features a warm-summer Mediterranean climate (Köppen: Csb), with influences of an oceanic climate (Cfb) like the north of Spain. As a result, its climate shares many characteristics with the coastal south: warm, dry summers and mild, rainy winters. Cool and rainy days can, occasionally, interrupt the dry season. These occasional summer rainy periods may last a few days and are characterised by showers and cool temperatures around 20 °C (68 °F) in the afternoon. The annual precipitation is high and concentrated in the winter months, making Porto one of the wettest major cities of Europe. However, long periods with mild temperatures and sunny days are frequent even during the rainiest months. Summers are typically sunny with average temperatures between 16 and 27 °C (61 and 81 °F), but can rise to as high as 38 °C (100 °F) during occasional heat waves. During such heat waves, the humidity remains quite low. Nearby beaches are often windy and usually cooler than the urban areas. Summer average temperatures are a few degrees cooler than those expected in more continentally Mediterranean influenced metropolises on the same latitude such as Barcelona and Florence. Winter temperatures typically range between 5 °C (41 °F) during morning and 15 °C (59 °F) in the afternoon, but rarely drop below 0 °C (32 °F) at night. The weather is often rainy for long stretches, although prolonged sunny periods do occur. Porto hosts a popular Portuguese newspaper, Jornal de Notícias. The building where its offices are located (which has the same name as the newspaper) was up to recently[when?] one of the tallest in the city (it has been superseded by a number of modern buildings which have been built since the 1990s). Porto's main railway station is situated in Campanhã, located in the eastern part of the city and connected to the lines of Douro (Peso da Régua/Tua/Pocinho), Minho (Barcelos/Viana do Castelo/Valença) and centre of Portugal (on the main line to Aveiro, Coimbra and Lisbon). From Campanhã station, both light rail and suburban rail services connect to the city center. The main central station is São Bento Station, which is itself a notable landmark located in the heart of Porto. Porto is well connected with Lisbon with high-speed trains called Alpha Pendular, that cover the distance in 2h 42min. The intercities take slightly more than 3 hours to cover the same distance. Currently the major project is the Porto Metro, a light rail system. Consequently, the Infante bridge was built for urban traffic, replacing the Dom Luís I, which was dedicated to the light rail on the second and higher of the bridge's two levels. Six lines are open: lines A (blue), B (red), C (green) and E (purple) all begin at Estádio do Dragão (home to FC Porto) and terminate at Senhor de Matosinhos, Póvoa de Varzim (via Vila do Conde), ISMAI (via Maia) and Francisco Sá Carneiro airport respectively. Line D (yellow) currently runs from Hospital S. João in the north to Santo Ovídio on the southern side of the Douro river. Line F (orange), from Senhora da Hora (Matosinhos) to Fânzeres (Gondomar). The lines intersect at the central Trindade station. Currently the whole network spans 60 km (37 mi) using 68 stations, thus being the biggest rapid transit system in the country. The city has an extensive bus network run by the STCP (Sociedade dos Transportes Colectivos do Porto, or Porto Public Transport Society) which also operates lines in the neighbouring cities of Gaia, Maia, Matosinhos, Gondomar and Valongo. Other smaller companies connect such towns as Paços de Ferreira and Santo Tirso to the town center. In the past the city also had trolleybuses. A bus journey is 1.85 Euro, which must be paid in cash. A tram (streetcar) network, of which only three lines remain one of them being a tourist line on the shores of the Douro, saw its construction begin on 12 September 1895, therefore being the first in the Iberian Peninsula. The lines in operation all use vintage tramcars, so the service has become a heritage tramway. STCP also operates these routes as well as a tram museum. The first line of the area's modern-tram, or light rail system, named Metro do Porto, opened for revenue service in January 2003 (after a brief period of free, introductory service in December 2002). The average amount of time people spend commuting with public transit in Porto, for example to and from work, on a weekday is 47 min. 6.5% of public transit riders, ride for more than 2 hours every day. The average amount of time people wait at a stop or station for public transit is 12 min, while 17.4% of riders wait for over 20 minutes on average every day. The average distance people usually ride in a single trip with public transit is 6 km, while 5% travel for over 12 km in a single direction. Many renowned Portuguese music artists and cult bands such as GNR, Rui Veloso, Sérgio Godinho, Clã, Pluto, Azeitonas and Ornatos Violeta are from the city or its metropolitan area. Porto has several museums, concert halls, theaters, cinemas, art galleries, libraries and bookshops. The best-known museums of Porto are the National Museum Soares dos Reis (Museu Nacional de Soares dos Reis), which is dedicated especially to the Portuguese artistic movements from the 16th to the 20th century, and the Museum of Contemporary Art of the Serralves Foundation (Museu de Arte Contemporânea). In 2005, the municipality funded a public sculpture to be built in the Waterfront Plaza of Matosinhos. The resulting sculpture is entitled She Changes by American artist, Janet Echelman, and spans the height of 50 × 150 × 150 metres. Over the last years, Porto has experienced significant tourist expansion, mainly[according to whom?] caused by the Ryanair hub at Francisco de Sá Carneiro Airport. Porto won the European Best Destination 2012, 2014 and 2017 awards. The city has a large number of public and private elementary and secondary schools, as well as kindergartens and nurseries. Due to the depopulation of the city's interior, however, the number of students has dropped substantially in the last decade, forcing a closure of some institutions. The oldest and largest international school located in Porto is the Oporto British School, established in 1894. There are more international schools in the city, such as the French School and the Deutsch School, both created in the 20th century. As in most Portuguese cities, football is the most important sport. There are two main teams in Porto: FC Porto in the parish of Campanhã, in the eastern part of the city and Boavista in the area of Boavista in the parish of Ramalde, in the western part of the city, close to the city centre. FC Porto is one of the "Big Three" teams in the Portuguese league, and was European champion in 1987 and 2004, won the UEFA Cup (2003) and Europa League (2011) and the Intercontinental Toyota Cup in 1987 and 2004. 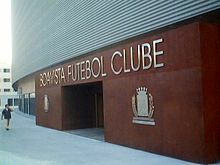 Boavista have won the championship once, in the 2000–01 season and reached the semi-finals of the UEFA Cup in 2003, where they lost 2–1 to Celtic. Formerly, Salgueiros from Paranhos was a regular first division club during the 1980s and 1990s but, due to financial indebtedness, the club folded in the 2000s. The club was refounded in 2008 and began playing at the regional level. They now play at the third level of Portugal's national football pyramid. However, the new Salgueiros club plays outside the city in Pedrouços, Maia. The biggest stadiums in the city are FC Porto's Estádio do Dragão and Boavista's Estádio do Bessa. The first team in Porto to own a stadium was Académico, who played in the Estádio do Lima, Académico was one of the eight teams to dispute the first division. Salgueiros, who sold the grounds of Estádio Engenheiro Vidal Pinheiro field to the Porto Metro and planned on building a new field in the Arca d'Água area of Porto. Located a few hundred metres away from the old grounds, it became impossible to build on this land due to a large underground water pocket, and, consequently, they moved to the Estádio do Mar in Matosinhos (owned by Leixões). For the Euro 2004 football competition, held in Portugal, the Estádio do Dragão was built (replacing the old Estádio das Antas) and the Estádio do Bessa was renovated. ^ "Portugal International Dialing Code". Retrieved 12 September 2010. ^ "The 7 cheapest European cities to live in". Business Insider UK. Retrieved 21 November 2016. ^ Thomas Brinkoff, Principal Agglomerations of the World, Retrieved 12 March 2009. Data for 1 January 2009. ^ "The World According to GaWC 2018". Globalization and World Cities Research Network. Retrieved 29 November 2018. ^ "Online Etymology Dictionary". Retrieved 18 December 2006. ^ "Port Wine". Archived from the original on 23 February 2008. Retrieved 6 October 2006. ^ a b "Europe's best destinations 2014 – Europe's Best Destinations". 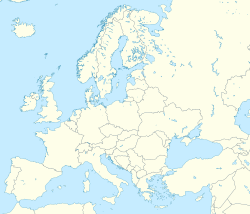 europeanbestdestinations.org. ^ a b c "Historic Centre of Oporto". World Heritage List. UNESCO World Heritage Centre. Retrieved 9 October 2014. ^ Semënova-Head, Larisa; Head, Brian F. "Vestígios da presença sueva no noroeste da península ibérica: na etnologia, na arqueologia e na língua". Revista Diacrítica. 27 (2): 257–277. Retrieved 29 December 2018. ^ Collins, Roger (1989). The Arab Conquest of Spain 710–797. Oxford, UK / Cambridge, USA: Blackwell. pp. 39–40. ISBN 0-631-19405-3. ^ "Tratado de paz, amizade e confederação entre D. João I e Eduardo II, rei de Inglaterra, denominado Tratado de Windsor" (in Portuguese). Portuguese National Archives Digital Collection. Retrieved 4 January 2013. ^ Winslett, Matthew (2008). The Nadir of Alliance: The British Ultimatum of 1890 and Its Place in Anglo-Portuguese Relations, 1147—1945. ProQuest. p. 3. Retrieved 10 February 2016. ^ "The Mariners' Museum – EXPLORATION through the AGES". marinersmuseum.org. Archived from the original on 7 April 2016. Retrieved 10 February 2016. ^ Francis, A.D. John Methuen and the Anglo-Portuguese Treaties of 1703. The Historical Journal Vol. 3, No. 2, pp. 103 – 124. ^ Glover, Michael (1974). The Peninsular War 1807 – 1814, A Concise Military History. Penguin Books. pp. 96–97 description of the retreat of Soult along the Valongo and Amaranthe road. ISBN 9780141390413. ^ Rocha, António Silva Lopes (1829). Unjust Proclamation of His Serene Highness The Infante Don Miguel as King of Portugal or Analysis and Juridical Refutation of the Act Passed by the Denominated Three States of the Kingdom of Portugal on the 11th of July, 1828; Dedicated to the Most High and Powerful, Dona Maria II. Queen Regnant of Portugal. London, England: R. Greenlaw. ^ Tucker, Spencer C. (2009). A Global Chronology of Conflict: From the Ancient World to the Modern Middle East. Santa Barbara, California: ABC-CLIO. p. 1158. Retrieved 10 February 2016. ^ Costa, Patrícia (2005). "Ponte de D. Luís (IPA no. 00005548)". SIPA – Sistema de Informação para o Património Arquitectónico (Information System for Architectural Heritage) (in Portuguese). Retrieved 22 September 2014. ^ Diário da Junta Governativa do Reino de Portugal. Colecção Completa, nº 1 (19 Jan 1919) – nº 16 (13 Fev 1919), Porto, J. Pereira da Silva, 1919. ^ Luís de Magalhães, "Porque restaurámos a Carta em 1919", Correio da Manhã, 27 e 28 de Fevereiro de 1924. ^ "Porto UNESCO Classification". Archived from the original on 11 March 2008. Retrieved 2 October 2008. ^ "Law nr. 11-A/2013, pages 552 99–100" (PDF). Diário da República (in Portuguese). Retrieved 29 July 2014. ^ Monge-Barrio, Aurora; Gutiérrez, Ana Sánchez-Ostiz (9 February 2018). Passive Energy Strategies for Mediterranean Residential Buildings: Facing the Challenges of Climate Change and Vulnerable Populations. Springer. ISBN 9783319698830. ^ "Normais Climatológicas – 1981–2010(provisórias) – Porto" (in Portuguese). Instituto de Meteorologia. Retrieved 19 January 2013. ^ "Porto (08546) - WMO Weather Station". NOAA. Retrieved 18 April 2019. ^ "Porto, Portugal - Climate data". Weather Atlas. Retrieved 16 March 2017. ^ "Petrogal domina exportações". Archived from the original on 7 February 2009. Retrieved 9 July 2008. ^ "Train Porto - Vigo". ^ "Luso Pages - Oporto / Porto (Portugal) Trams and Trolleybuses". Altrinchamfc.co.uk. Retrieved 4 December 2016. ^ "Porto Light Rail Project, Portugal". Railway Technology. Retrieved 6 May 2009. ^ "Porto Public Transportation Statistics". Global Public Transit Index by Moovit. Retrieved 19 June 2017. Material was copied from this source, which is available under a Creative Commons Attribution 4.0 International License. ^ AtlasWeb (2011). "Rotterdam and Porto: Cultural Capitals 2001: visitor research. – ATLAS Shop". atlas-webshop.org. Retrieved 5 July 2011. ^ "Top shelves". The Guardian. 11 January 2008. Retrieved 22 January 2008. ^ "São João Festival (St John Festival)". World Events Guide. Archived from the original on 17 September 2008. Retrieved 6 May 2009. ^ "Federação Académica do Porto". Fap.pt. Retrieved 6 May 2009. You can check http://www.f8life.com for entertainment events in Porto. ^ "Lycée Français International de Porto". LFIP. ^ "London tuberculosis rates now at Third World proportions". PR Newswire. 6 December 2002. Retrieved 6 May 2009. ^ "View Article". Eurosurveillance. Archived from the original on 26 September 2007. Retrieved 6 May 2009. ^ Portugal|2015 EuroBasket, ARCHIVE.FIBA.COM. Retrieved 19 June 2016. ^ "Bristol City – Town twinning". Bristol City Council. Archived from the original on 28 July 2011. Retrieved 17 July 2009. ^ "Sister Cities of Nagasaki City". International Affairs Section, Nagasaki City Hall. Archived from the original on 29 July 2009. Retrieved 10 July 2009. ^ The Municipality of Porto; Bangkok Metropolitan Administration (5 August 2016). "Memorandum of understanding between The Municipality of Porto Portugal Republic and The Bangkok Metropolitan Administration Kingdom of Thailand". ^ Marchetti, Claudia (13 May 2016). "Marsala e Porto stringono un gemellaggio: "Insieme per la cultura"". Itacanotizie.it. Retrieved 29 December 2018. Wikimedia Commons has media related to Porto. Wikivoyage has a travel guide for Porto.